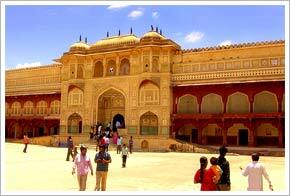 Amber Fort is a big hit with tourists when it comes to the forts of Rajasthan. It is perched on a hill and offers a picturesque view of the surroundings. It is located around 11 km from Jaipur. It was once the pride of the Kachhawa clan of Amber. The architecture of the fort is the perfect blend of the traditional Rajput and Mughal style. After a span of hundreds of years the fort still holds its charm. Raja Maan started the construction of the Amber Fort in the year 1592 but over the years Raja Jai Singh I kept making additions to it. The fort showcases the beautiful mixing of the red sand stone and the white marble. The walls of the interiors of the fort palace are decorated with paintings touching various themes, mirror and semi-precious stone work. The fort palace might look rough from outside i contrast to the interior which is simply breathtaking. The complex of the fort palace has a beautiful lake called Maota Lake where you can spend some time in the lap of nature. The main entrance of the fort is named as the Surajpol which leads to the Jaleb Chowk, the main courtyard. From here you can enter the palace. In the past, it also served as the ground where the army after winning the battle used to return and would showcase their war earnings to the gathered population. The Ganesh Pol within the fort palace is another huge gateway which is noteworthy. It is beautifully painted with the sacred image of Lord Ganesha. Diwan-i-Am or the Hall of the Public is famous for its several magnificent pillars. Charbagh garden is worth a visit for it has symmetrical landscaping. Other attractions inside the fort palace are Sheetla Mata Complex, Sukh Niwas, and the glittering Sheesh Mahal. You can reach the fort palace either by a car or simply mount an elephant.